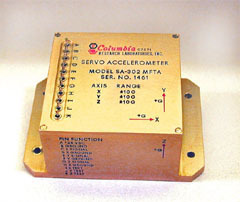 The Columbia Models SA-102MFTB and SA-302MFTA are precision miniature force balance accelerometers designed to operate from +24 to +32 VDC aircraft power. The high level output signal and inherent self-regulation qualities of the servo loop design make these accelerometers excellent candidates for airborne telemetry applications. The output signal format is compatible with most airborne VCO?s and signal processing systems. Both configurations incorporate the Columbia HP torquer system, which provides exceptional performance and reliability in the severe vibration and shock environments associated with aircraft and missile flights. The Model SA- 302MFTA is a compact triaxial version of the single axis Model SA-102MFTB.